When it’s time to get down to business, the new Business Suite Add-On has you covered. 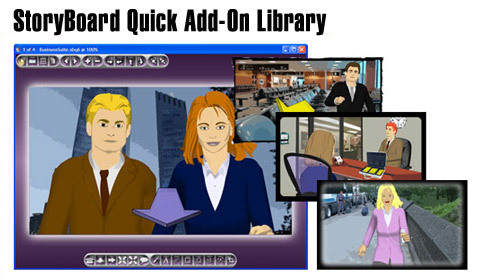 Our latest Storyboard Add-On content pack offers new colorizable corporate characters (Mr. & Mrs. Business) as well as a wealth of new City Locations and Office/Business props. Whether you are working on your next feature film, a new corporate video or the latest ad campaign, these stylish storyboard additions to your StoryBoard Quick or StoryBoard Artist application will give your storyboards the look to impress the suits! Get The Business Suite Today! Ms. Business comes ready to work and makes a great addition to the storyboard team! Coupled with new big city locations - both interiors and exteriors - the Business Suite adds a new dimension to your StoryBoard Quick or StoryBoard Artist application! 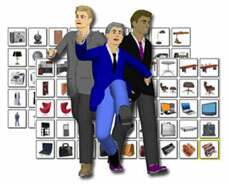 Colorizable Mr. Business can be saved into your My Characters for use time and time again while a whole host of new workplace props and furniture to help fill out the workspace! Get hundreds of new stylish storyboard graphics today with the all new Business Suite Add-On!